Inspired by the Japanese sandal Zori, the first Havaianas was created in Brazil in the year 1962. 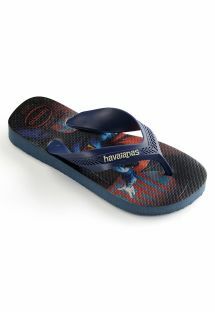 Havaianas flip flops have been an international success for over four decades, selling over 2.2 billion pairs worldwide. 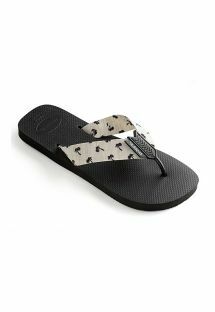 The key to this brand's success is the highly flexible rubber sole on each flip flop. A simple concept such as flexible rubber soles was enough to bring this brand a load of success. You can find the entire population of Brazil wearing the brand, including models of top glossy magazines. 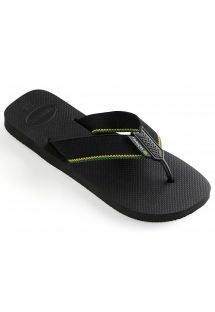 The Havaianas flip flops have become a fashionable accessory that has taken the world by storm. Check out our outstanding collection of Havaianas flip-flops for women! 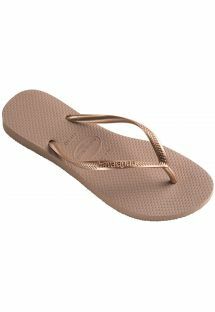 Newest models of the world’s most famous flip-flop brand available on Brazilian Bikini Shop! Havaianas are world’s favorite flip-flop brand! 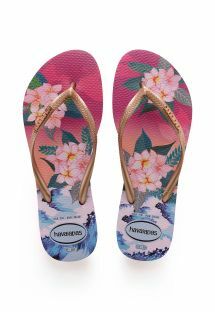 The word Havaianas is Portuguese means Hawaiians. 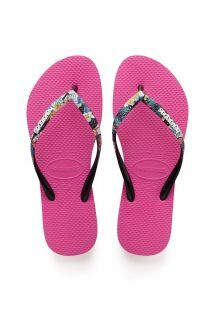 The Havaianas flip-flops for women are very durable, have a nice soft rubber sole, do not slip or rub the feet skin. They also have an interesting history and origins. The idea of creating these flip flops was based on Zori – traditional Japanese flip flops made of rice straw. Till today Havaianas’ sole is textures in rice grains, this trait makes it also exceptional and unique. 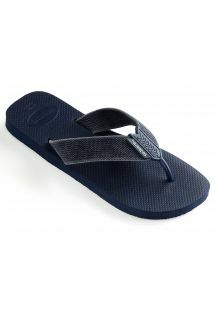 At the beginning of their career in the 1960’ the flip flops were sold in different sizes but only in white and blue. In the 90’s they started to come out in patterns and more colors and since that time the designers creativity has no limits! 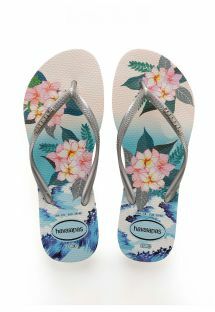 Today you can find Havaianas flip-flops for women with Swarovski elements, with original and slim stripe and many different prints: floral, tropical, animal and whole variety of colors and their combinations you can imagine! Havaianas last for much more than one season, but they are so likable and pretty that many women usually buy a few pairs in different colors to match their summer outfits! They are simply irresistible! Great choice of Havaianas flip-flops for men! Visit our website and choose from latest collection of the world’s favorite flip-flop brand! The newest trendy models as well as good old classics - shop now! Havaianas flip-flops for men were born in Brazil the 60's. 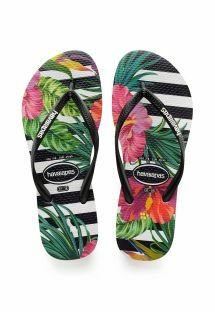 They gained very quickly more and more popularity and just within a few years everybody in Brazil wore Havaianas flip flops! You may wonder what has led the brand to such a huge success. The answer is easy: they were simple, easy to wear, perfect for Brazilian summer as well in the city as on the beach, comfortable and cheap. They also had a unique shape, based on Japanese Zori – flip-flop made from rice straw. Till today Havaianas sole is textured with rice grains, to honor the idea. 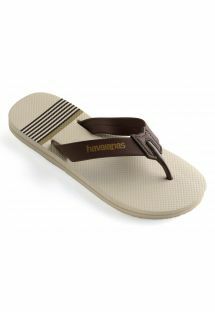 Nowadays Havaianas flip-flops for men come in many colors, different shapes (classic, surf, urban), styles (e.g. with leather elements) and prints. 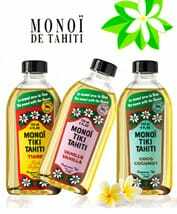 They are also available in all sizes, so every man should find something for himself. Havaianas are perfect for almost every summer occasion i.e. to the city, for a walk, to the beach, poolside, holidays… they are super comfy and multipurpose and that is why all the world felt in love with them more than 50 years ago! 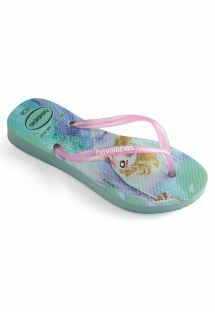 Havaianas flip-flops for girls from Brazilian Bikini Shop! 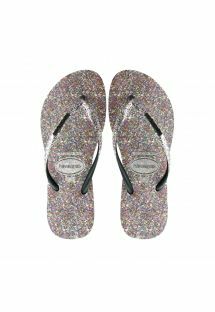 Only here you will find the widest collection of beautiful girly flip-flops from the world’s most famous Brazilian brand! Pretty patterns, cute colors and full size range! Havaianas flip-flops were created in 1962 and since then have gained huge popularity in the world! Everyone loves them, regardless of their age - children, adolescents and adults! Once Havaianas flip flops were only produced in white and blue, but things have changed since then. Today they are produced in many sizes and colors. 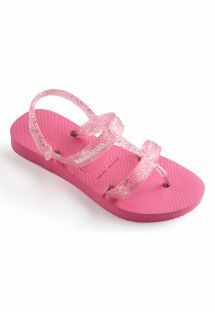 The collection of Havaianas flip-flops for girls is also very special! Comfort comes first, the second is adventure! 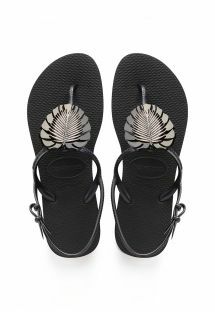 You can do literally everything in the Havaianas flip-flops, Brazilian girls spend their days wearing them - from morning to night. You can walk around the city, play with your friends, go to the beach or swimming pool and even use at home. No limits! 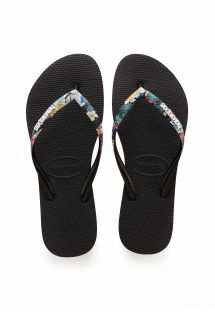 What's more, Havaianas flip flops for girls have unique designs and colors, so that both younger and older girls will find something for themselves! Those who love princesses will find flip-flops with their beloved characters, and those who prefer slightly more adult patterns will choose their dream pair from other beautiful proposals and designs that no adult woman would be ashamed of! Little feet in the world’s most famous flip-flops brand! Super comfortable, soft, perfectly designed and in wonderful colors and prints - Havaianas flip-flops for babies on Brazilian Bikini Shop! Havaianas flip-flops were invented more ten 50 years ago. Since that time a lot stayed the same – as classic models - but a lot has alo changed! Today the brand offers footwear not only for adults and teenagers but also for babies. Now also your child can profit from the best that the brand has to offer. And what is that? First of all – comfort. Havaianas material used in production of footwear is a specially design and crafted from a top secret, premium Brazilian rubber formula - a famous hallmark of the Havaianas brand. They do not rub the skin, they do not slip even on wet surfaces, stay well on feet and in case of Havaianas flip-flops for babies they have a special elastic band that holds the shoe on the foot. What is more, the flip-flops come in beautiful colors for boys, girls as well as in unisex version. They come with children’s favorite cartoon characters or even “adult-like” patterns e.g. in animal prints. From the size 19 to 28 – European sizes! 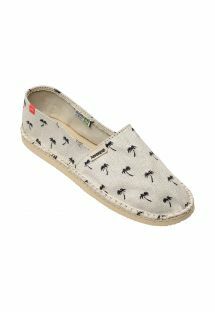 Havaianas espadrilles for men on Brazilian Bikini Shop! If you are looking for a summer shoes alternative but flip-flops are not the best idea? Choose one of our models – many colors and patterns will make then suitable for almost every occasion! Havaianas espadrilles for men are a perfect solution for summer, as men do not have many alternatives between flip-flops and sneakers. 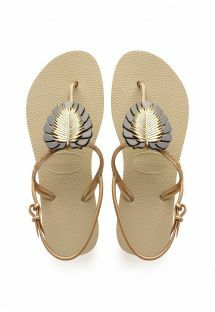 They will make you feel super comfortable and stylish at the same time and will give you a little beach look vibe. The fabrics are light and soft, they do not cut into the skin and yet stay well on feet. The Havaianas rubber sole, exactly the same as in flip-flops, will give you comfort and all other advantages: your skin will not be irritated and the foot or sole will not slip even when wet. 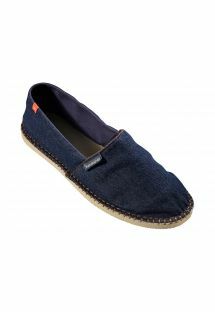 Wearing Havaianas espadrilles for men you will feel cool and stylish but still casual. There are many colors and patterns to choose, so that you may use them for many occasions. They will match almost every summer outfit as they look great with shorts, chinos and simple t-shirt or shirts. You may use them in the city, while night out as well as on the beach and summer promenade! The newest collection of Havaianas espadrilles for women available on Brazilian Bikini Shop now! Come and check latest models in beautiful colors and prints. Discover the real comfort and summer joy of life! Havaianas espadrilles for women combine both: the uniqueness of world’s favorite flip-flops rubber sole and the comfort of light summer sneakers. The sole is exactly the same as the one used in Havaianas flip-flops and sandals so you can enjoy its’ softness, the fact that it is not slippery even on wet surfaces, so that your foot will feel secure and stable. The covered material lets you enjoy summer shoes in situation when flip-flops are not the best solution. The material is soft and stretches a bit so that it fits your foot well and doesn't cut into the skin. They look great and fashionable in combination with trousers, skirt or summer dress. You can wash them in the machine – they are easy to keep clean. What is more, Havaianas espadrilles for women come in beautiful colors and patterns that will match almost every occasion. You will feel trendy and stylish! They are a must have for every summer season!